Antonin Scalia’s climate change legacy. 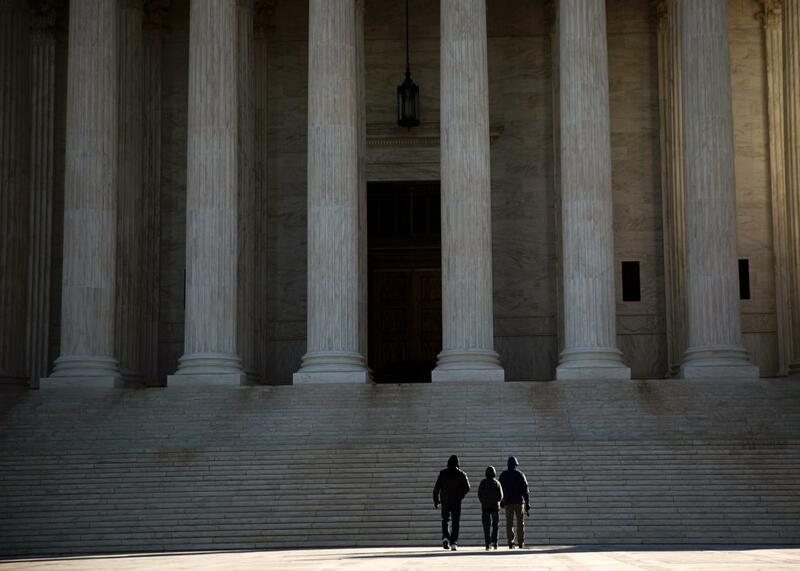 Visitors outside the U.S. Supreme Court following the death of Supreme Court Justice Antonin Scalia on Feb. 14, 2016. Scalia’s death comes just days after the Supreme Court issued an unprecedented stay that temporarily blocked the implementation of the Clean Power Plan, Obama’s centerpiece climate legislation. The Clean Power Plan isn’t perfect, but it was on pace to double the already accelerating rate of coal-fired power plant retirements by 2040. Last week’s surprising action by the Supreme Court—dubbed a “nightmare scenario” by the Hill—raised substantial fears among environmentalists that the court’s conservatives might eventually block the Clean Power Plan completely. At the very least, the stay buys some time for Republican hopefuls in this year’s presidential election; if one were to win, he could just cancel the executive order that launched the plan in the first place. The stay is still in place, but the climate law experts I talked to say Scalia’s death greatly boosts the eventual survival chances of the Clean Power Plan. A 4-4 court would guarantee that the lower court ruling would stand—and the D.C. Circuit Court is expected to approve the plan. “This unexpected and shocking development certainly increases the chances that the Clean Power Plan will ultimately be upheld by the Supreme Court if the next president is a Democrat,” Michael Gerrard, law professor at Columbia University, wrote in an email. That qualification—“if the next president is a Democrat”—is obviously a big one. Even if Republicans lose the election, they’ve already bagged a not-inconsequential victory, thanks to Scalia. “Among Justice Scalia’s legacies will be the delay of the Clean Power Plan’s implementation until at least after the election,” Michael Blumm of Lewis and Clark Law School wrote in an email. ClimateWire reports that the delay has kicked off an “expensive game of red light, green light,” as states and utilities struggle to predict how quickly they ought to move on phasing out coal at the local level. Should the Clean Power Plan be nixed by a Republican president, it might even threaten the Paris accord (which compels virtually every nation to reduce emissions, the first agreement of its kind) by sowing doubt in other major economies, like India and China, of America’s true intentions on climate policy. It’s never appropriate to celebrate a death. But we do need to look at how someone’s passing might change things—and climate activists, who are increasingly a major part of the electorate, now have a big boost to push for bolder promises from Hillary Clinton and Bernie Sanders. Backed by a Supreme Court that would presumably place greater value on the planet’s health, there’s nowhere to go but full-speed ahead in the race to reduce humanity’s carbon footprint.